I love to cook for my family but baking is my real passion! Every week I love to bake up tasty treats like homemade breads, pies, muffins, cookies and brownies. We are not big fans of store-bought baked goods so 9 chances out of 10, I make & bake them myself. For the past few years I have been using Nielsen-Massey Vanilla but had never tried their Pure Chocolate Extract. Well, until now! This extract is very versatile in the kitchen and once you have it, you will find all different kinds of ways to use it. Crafted from the finest cocoa beans, the Pure Chocolate Extract embodies the uninhibited depth and flavor of dark chocolate. This extract is ideal for adding extra layers of this divine flavor to any recipe with chocolate as the base. Also, use it to add subtle distinction to a wide range of dishes, including beverages, desserts, sauces, chilis and other spicy foods. This extract pairs exceptionally well with chile peppers, tomatoes, legumes and, naturally, vanilla. 1 Tbs. Chocolate Extract + 1 tsp. Sugar = ½ oz. Semi-sweet Chocolate. I decided to try out my new Pure Chocolate Extract in a batch of homemade brownies. I followed my normal brownies recipe and then added in 1 Tbsp. of the Pure Chocolate Extract. Mixed up my batter, poured it into my baking pan and baked as normal. With this particular batch of chocolate brownies I also added in some miniature marshmallows which my family just loves. That addition makes them fudgy and gooey...just the way we like them! So, now for the taste-test. For once...our brownies had a decadent and pure chocolate taste! It wasn't overly chocolatey at all. They had a richness to them that left you craving for more! Matter of fact, the family demolished that pan of brownies in record time! I am so glad that I have this bottle of Pure Chocolate Extract in my pantry now. With the holidays coming and baking season upon us, I am sure I will be reaching for it often. Love it! 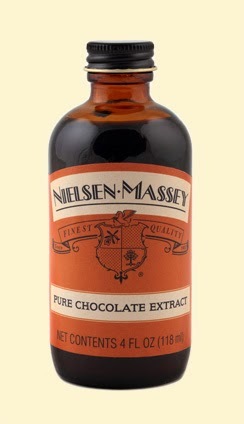 Giveaway: One lucky winner is going to win a bottle of the Nielsen-Massey Pure Chocolate Extract! Giveaway Details: This giveaway is open to residents of the USA ONLY who are age 18 and over. Please read the Terms of Service and Disclaimer Policy before entering. You must be a PUBLIC FOLLOWER of this Blog to have your entries count in my giveaways. (Follow via Google Friend Connect) All non-blog followers will have their entries disqualified after the giveaway closes. This giveaway will close on October 25th, 2014 at midnight EST time. I entered the insulated lunch bag from Lyn Dorf giveaway. There are a couple I'd like to try. The Pure Almond Extract, Madagascar Bourbon Pure Vanilla sugar & the Pure Vanilla Extract. I like the Pure Almond Extract. I have tried many of them! I would love to try the Tahitian Pure Vanilla Extract! Entered Heli Beat giveawy on TCC. Organic Fairtrade Madagascar Bourbon Pure Vanilla Extract. I entered the TCC Musselman’s Apple Sauce giveaway. The Pure Vanilla Extract. I don't like imitation extracts. Sent Shelly a friend request (Mandy Peters Kauffman). Entered Escape gift box subscription giveaway on TCC. Entered the Corelle giveaway on TCC. I entered the Musselman’s Apple Sauce. I'd try their Pure Almond Extract. Entered Cooks Essentials Kitchen Dictionary book giveaway on TCC. Entered Flash Cash giveaway on TCC. I entered the Opportuniteas Premium Teas giveaway. I entered the TCC Scrabble Electronic Scoring Game giveaway. I entered the Scrabble Electronic Scoring Game giveaway. Entered Learning Resources Geometric Shapes giveaway on TCC. I'd like to try the vanilla bean paste. Entered Hundred Pieces of Me giveaway on TCC. I entered the Sons of Liberty DVD giveaway. Entered Heli Beast giveaway on TCC. I entered the Men’s bamboo pajama pants. I'd like to try Nielsen-Massey Madagascar Bourbon Pure Vanilla Extract. Sent a friend request to Shelly on FB: Nicole Sender. I entered the Heli Beast-Flying Predator Remote Control Toy giveaway. Entered homemade soaps book giveaway on TCC. I am a baker and would like to try this companies products. I have recently gotten into anything and everything with lemon. My first choice to try would be Pure Lemon Extract. I entered the wonderful, The Pink Monogram Barn Jacket giveaway. I entered the Womens Fashion Sunglasses from SlideCloud. Entered Midnight Velvet infinity scarf giveaway on TCC. I entered the Purex Crystals. I would like to try the Pure Orange Extract. Entered the Flash Amazon GC/Paypal giveaway on TCC. Entered flash giveaway amazo paypal! I entered the TCC Weekend $50 Flash Giveaway. I entered the My Monopoly Board Game giveaway. Entered the Slidecloud glasses giveaway! Entered Little Scholar Kid's Learning Tablet giveaway on TCC. Another product from Nielsen Massey that I think I would love to use in my kitchen is their Pure Coffee Extract. Entered Superior Clogs giveaway on TCC. I entered the Ornaments with Love giveaway. Entered Ava & Lala DVD giveaway on TCC. Entered Pink Monogram Barn Jacket giveaway on TCC. I entered the Beethoven's Treasure Tail DVD giveaway. One of my favorites is the Pure Vanilla Extract I use that all the time and would love to try there's and compare it to the brand I use. Entered the Dead and the Damned 2 DVD giveaway on TCC. I entered the Santa’s Magic Toy Bag DVD giveaway. Entered Musselman's giveaway on TCC. I entered Green Hope Bracelet from Sylca Designs. Entered Opportuniteas giveaway on TCC. I entered the Frida's Fruit Fiesta Game. Entered Scrabble giveaway on TCC. I would like to try the Rose Water. I entered the Opportuniteas giveaway. I'd also love to have the Pure Orange, Pure Almond and Pure Coffee extracts. Thanks!